Sometimes, men are so hard to understand! When we first see our husbands at the end of our work day, whether working away from home or inside the home, we LOVE to talk about how the day has gone. We eagerly await our husband’s arrival so that we can share the details about the children, the crazy thing the neighbors did today, the weird stuff that happened at work, etc. We LOVE to verbally process the day with our husbands. But guess what? Most men loathe communicating with their wives as soon as they walk in the door. They long to spend some time in their “nothing box”. Huh? It’s hard for women to understand a man’s need for his “nothing box” because most women don’t even know what one is! I’ve had a few men explain it to me, and here’s the basic idea. After a long day at work, most men need to enjoy either quiet or mindless activity in order to decompress from their day. 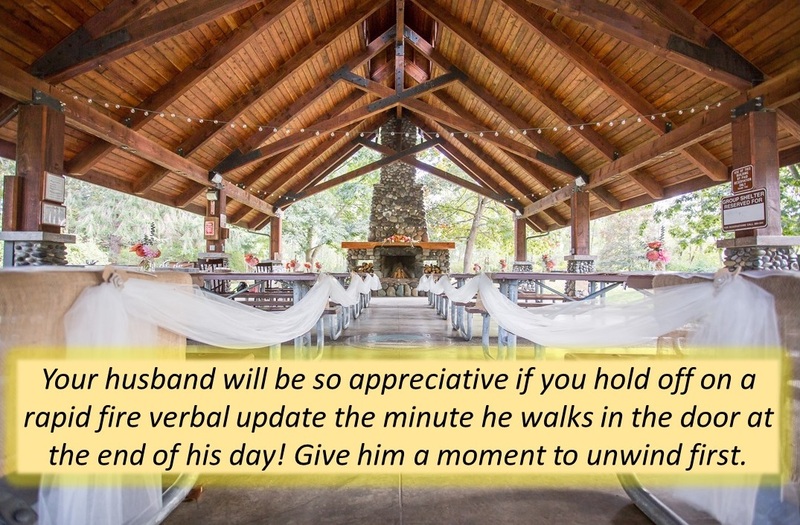 This means your husband probably doesn’t want to hear the fascinating details of your day as soon as he walks in the door and he probably doesn’t want to talk about his day either…at least not for a while.